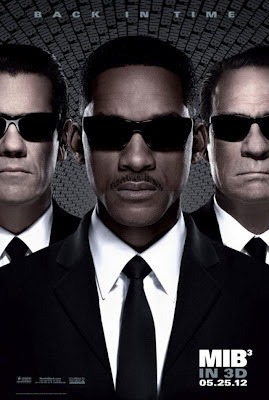 The first thing which came to mind after watching MIB 3 is that why it took 10 years before this sequel was released. MIB 2 was released in 2002. Hearing it from Agent J (Will Smith) himself during one of his interviews about the film, it was all about perfect timing. There was a need to find that perfect plot which will be worthy enough to make a sequel of the successful MIB movie franchise. MIB 3 is indeed worth the wait. The story begins with Boris the Animal (Jemaine Clement) escaping from the LunarMax prison (obviously located in the moon) through the aide of his girlfriend Lily Poison (Nicole Scherzinger). Through a time travel device he acquired from Jeffrey Price, son of Obadiah Price who was also imprisoned in LunarMax for inventing the time travel equipment, Boris was able to jump back in time on July 16, 1969 and killed Agent K before the latter captured and imprisoned him. This makes Agent K dead 40 years ago, preventing the release of the ArcNet from being installed into the moon, and making the Earth vulnerable for an attack from the Boglodites, Boris’ supposed extinct race. Surprisingly, only Agent J remembers about Agent K. Agent O (Emma Thompson) seems to understand the probability of Boris jumping back in time to change the course of time and advices the latter to seek assistance from Jeffrey Price. So J goes back to July 15, the day when Boris killed two alien Earth residents in the hope to annihilate the younger Boris before the older one shows up and kills the younger K.
J was closed to being neuralized in the then MIB headquarters but was able to convince K to help him with his quest. Griffin (Michael Stuhlbarg), an Arcadian who possesses the ability to see the future and safeguards the ArcNet was instrumental in making J’s time travel purpose a success. The older Boris died during the Apollo 11 rocket launch while the younger Boris was not arrested but killed by K instead. The ArcNet was then safety launched into the moon through the NASA moon rocket. J then returns to present day MIB knowing what took place back in 1969. The weird turn of events, however, will lead you to believe that K knew what happened. He was there when J’s (was then called James) father died in the hands of the younger Boris while he was aiding the group in their mission to send the ArcNet to the moon. Griffin did say that there will still be one who dies in the process in exchange for another’s life. It was just monumental that it was J’s dad, who was then a military officer in Cape Canaveral. Although James (then Agent J) was neuralized by K so he can forget what transpired that day, he was later on recruited by K to be a part of MIB and his partner for 14 years. MIB 3 was not as explosive as the previous MIB films but you won’t be disappointed if you intend to watch the movie for its special effects. You’ll find lots of futuristic guns, gadgets, and automobiles. This includes a monocycle bike during MIB’s 1969 chapter. Josh Brolin, who played the younger K at age 29, effectively imitates the older Agent K’s character of being stiff and formal. Tommy Lee Jones only had a few scenes in this movie. He is evidently older now, thus, the inability to participate in numerous action scenes. That’s probably why it took so long to come up with a plot which will still accommodate Jones as a part of the movie. Another twist which was not emphasized in the previous films was Agent K’s romance with Agent O. The two was never an item, though, as both of them dedicated their life in the cause of MIB instead. Agent J too was still single in this sequel. There was no romantic flavor for him in the movie in contrast to the previous sequel. Frank, the alien pug was only displayed in a photo frame hanging over J’s apartment bed. As for the question of whether another MIB sequel is due to be filmed soon, it will once again depend on that perfect timing of a good plot. Agents K and O’s romance will be great and so is a 1969 MIB team. It can also be set to a distant future where a new breed of MIB agents is to be featured. Or it can simply be another Will Smith and Tommy Lee Jones team up, like the 1997 and 2002 films. A sequel surely being brewed is not an MIB movie though but another Will Smith classic, Bad Boys with Martin Lawrence.